Each athlete has access to one points voucher throughout the season if the need arises. It may be used if an athlete is sick or away on holidays, camp, etc. 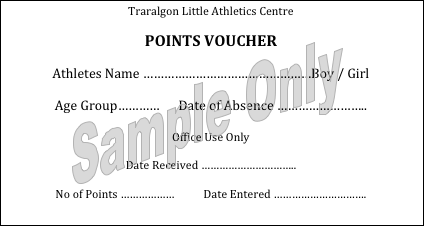 The voucher must be forwarded to the Recorder no later than 7 days after the meet that has been missed for points to be validated. This 7 day period will be adhered to with no exceptions! The athlete will receive 1 point for each event that was missed. No bonus points will be given for all events completed. Points vouchers are available at the office, fill in details and leave in tray. At the end of the season our winners of each age group 1st, 2nd, 3rd are determined by these accumulated points.